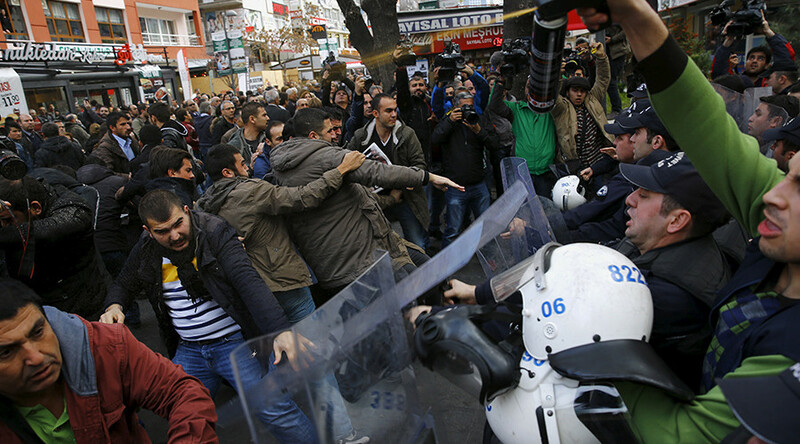 An RT crew visited the newspaper's office in Istanbul, and were allowed to talk with its reporters, while hundreds of people gathered outside the media office to protest against the authorities' decision to arrest Cumhuriyet editor-in-chief Can Dundar, and senior editor of the paper in Ankara, Erdem Gul. 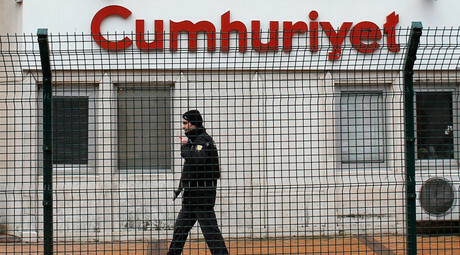 In addition to the news of the Cumhuriyet journalists' arrests, it was announced on Friday that another Turkish media worker, Daily Hurriyet columnist and former editor-in-chief Ertugrul Ozkok faces up to five years and four months in prison for "insulting" the Turkish president in an opinion piece published in September. The indictment claimed Ozkok's writing following the tragic death of a Syrian refugee boy, whose body was washed ashore a Turkish beach, exceeded the limits of "acceptable criticism," Daily Hurriyet said. With a Turkish prosecutor asking a court to imprison the Cumhuriyet journalists pending trial on charges of treason, espionage and terrorist propaganda, the mood in the office was tense and many refused to talk to RT on camera, but still wanted to be heard. In May, the outlet which is considered to be the opponent of the government, published photos of weapons it said were then transferred to Syria by Turkey's intelligence agency. Those who sent the convoy from Turkey knew that the weapons were "heading to end [up] in ISIS hands," one of the Cumhuriyet bosses told RT's Ilya Petrenko. "There was that flag that belongs to ISIS... [it could be seen] very clearly [from] Turkish border line," the journalist said. Turkish officials made contradictory statements after the paper blew the whistle, first saying that the arms "were going to the Free Syrian Army," then denying the delivery altogether, and then saying the "aid was destined for the Turkmen." "When you ask [the government] who [the Turkmen] are, they tell you that those are our guys," another Cumhuriyet journalist told RT. But when the reporter "personally talked" to the fighters supported by her government in Syria, she said she didn't see how they could be different from the terrorists, saying "they were all brothers." "[There is] no difference between ISIS and the other guys. I think there is a problem with the labels here, because all the world is focused on ISIS, but there are other jihadist groups there, and they have links with Al-Nusra or ISIS, [while] Turkey says 'we are helping that groups – not ISIS'," the Turkish journalist added. "ISIS is smuggling oil to Turkey and through Turkey... it's kind of common knowledge by now. But the big question is [whether] it's possible that they are doing it without the government's knowledge or some authority's knowledge," one of Cumhuriyet's employees told RT.